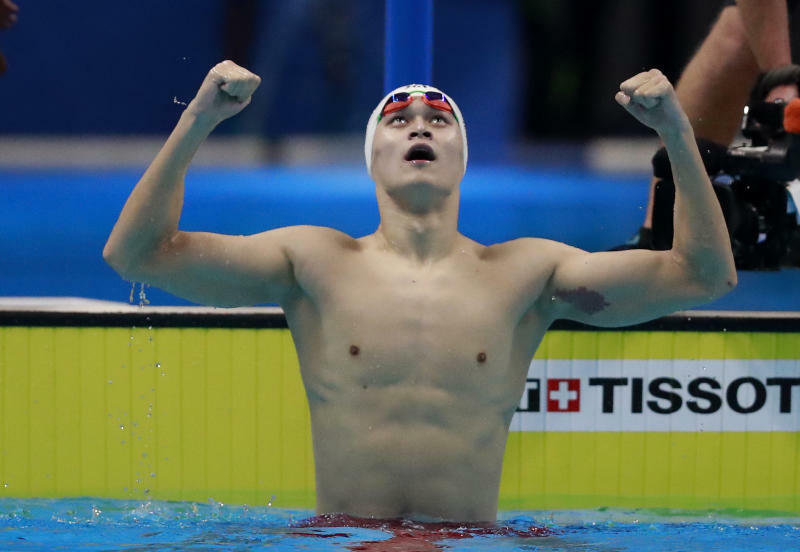 JAKARTA, Indonesia (AP) — After waiting so long to win this title, Sun Yang really wanted to see his flag flying at the Asian Games. China's greatest swimmer finally won the 200-meter freestyle gold after placing second at the 2010 and '14 editions of the continental games. Sun, a three-time Olympic gold medalist and nine-time world champion, had straddled the lane rope and held both arms up in triumph after touching the wall in 1 minute 45.43 seconds Sunday on the first night of finals. 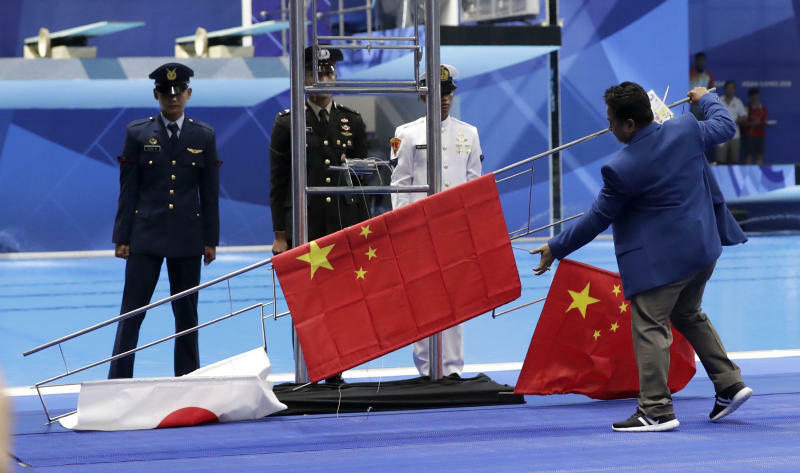 Everything was going to plan until he was standing atop the podium and a technical malfunction resulted in the flags of the three medalists crashing to the ground. The 6-foot-7 (2-meter) Sun got off the podium, walked to some officials and demanded they do it again. The flags were re-attached to the broken hoist but couldn't be raised as the anthems were replayed. Sun later played down the incident, saying he was just relieved to win the event. "I've waited eight years for this title," Sun said. "People worried more for me over the 200 — (they) don't worry as much for the longer distances. "I think my experience and aggressiveness were the keys. It is a good start for the Chinese men's swimming team." Sun is targeting victories in every freestyle event from the 200- to the 1,500-meters and kicked it off with a comfortable win, finishing more than a second clear of Katsuhiro Matsumoto of Japan. China won four of the first seven swimming golds, edging archrival Japan by one with five days remaining in the pool. Rikako Ikee led the Japanese women's 4x100-meter relay team off to a games record after Daiya Seto's win in the men's 200-meter butterfly and Satomi Suzuki's win in the women's 100 breaststroke. China claimed the first gold medal of the games in the morning session with Sun Peiyuan's acrobatic victory in wushu's changquan discipline. Sun scored 9.75 to claim a gold medal in the same city where he won the world title in 2015, holding off local hope Edgar Marvelo and Tsai Tse-min of Taiwan. Taiwan won the first of the gold medals in Palembang — on the island of Sumatra and more than 400 kilometers (250 miles) northwest of the capital — with Lin Ying-shin and Lu Shao-chuan combining for a games record 494.1 points in the 10-meter air rifle mixed team final. Also in Palembang, a joint Koreas rowing team finished last in the first heat of the lightweight men's four competition behind Indonesia, Uzbekistan and Hong Kong. South Koreans Kim Su-min and Park Tae-hyun and North Koreans Yun Chol Jin and Kim Chol Jin only started training together last month after their countries agreed to enter joint teams for three rowing events, a dragon boat crew and women's basketball. Defia Ronsmaniar won Indonesia's first gold after beating Marjan Salahshouri of Iran in the women's individual poomsae final. Thailand upset South Korea for the women's team title. Mongolia opened its gold medal account when Bekhbayer Erdenebat beat North Korea's Kang Kum Song in the men's 57-kilogram freestyle wrestling final. India made up for two-time Olympic wrestling medalist Kumar Sushil's shocking first-round loss when Barjang Bajrang won the 65-kilogram class. 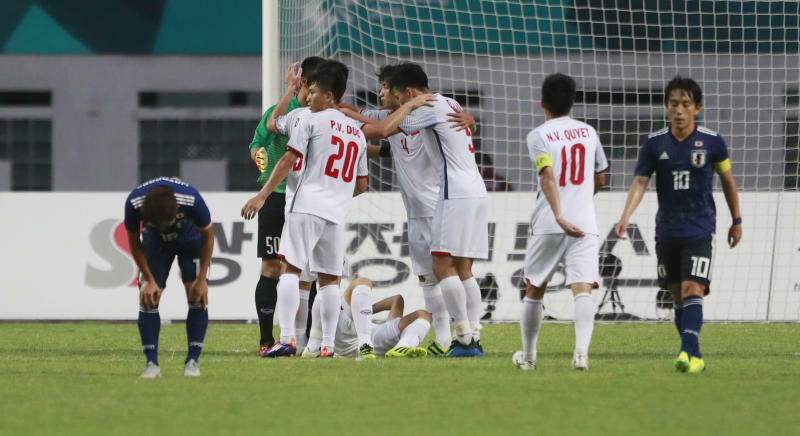 In one of the biggest shockers of the day, Vietnam edged Japan 1-0 on Quang Hai Nguyen's left-foot shot from the edge of the area after a defensive blunder in the third minute to top Group D. Both teams will advance to the knockout round.